It's Thomas the Tank Engine, and he's ready to take you on another journey filled with exciting adventures of the Island of Sodor. Travel with Thomas when he gets to pull his very own train for the first time - - with unexpected results. Find out what really "shocks" Percy and hold your breath when some snow jams one of the Island's signals and leads Henry to disaster. 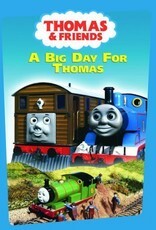 It's your Big Day, so get ready to join Thomas, James, Toby and the rest of your friends for non-stop fun. All Aboard!